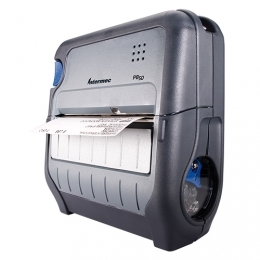 With the Honeywell PB50 you acquire a reliable partner for fast mobile printing. With up to 102 mm per second, it is one of the leaders in speed and efficiency. The largest model of the PB series prints both labels and receipts with widths between 49 and 112 mm. Its robust housing withstands challenging daily life in the most varying of applications. The PB50 features IP54 certification, providing protection against splash water and dust. It is also vibration and impact-resistant, works flawlessly in extreme temperatures and withstands drops up to 1.5 m.
Integrated label sensors keep the number of print errors to a minimum and significantly reduce paper consumption. Via SmartSystems the mobile printer is centrally managed. Install your own applications, based on the programming language Fingerprint, in order to keep the PB50 ready for the future and its changing requirements. Integration into existing infrastructures is done standard using USB or RS232. Optionally decide for a wireless connection, via Bluetooth or Wi-Fi.